Dedicated music doctor offers violin, piano, composition and music theory lessons for all ages. 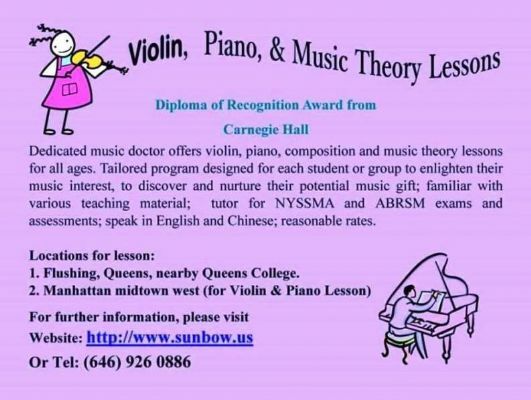 Tailored program designed for each student or group to enlighten their music interest, to discover and nurture their potential music gift; familiar with various teaching material; tutor for NYSSMA and ABRSM exams and assessments; speak in English and Chinese; reasonable rates. 1. Flushing, Queens, nearby Queens College.